Land Access considerations can be defined for a location on the facility level in SPM. Any planned or scheduled task that references this location will inherit this land access requirement, unless it is is disabled or overwritten on a planned or scheduled task level. See Land Access for more details on the concept of Land Access and how it can facilitate the planning of sampling events. 1.After logging in to SPM, select a facility. 3.Click the Land Access button in the Forms group on the ribbon. 4.Enter the Land Access information; required fields are sys_loc_code (location ID) and land_access_days, or the number of days prior to the event that land access must be secured. To copy an existing Land Access record, select the row in the window and click Copy. 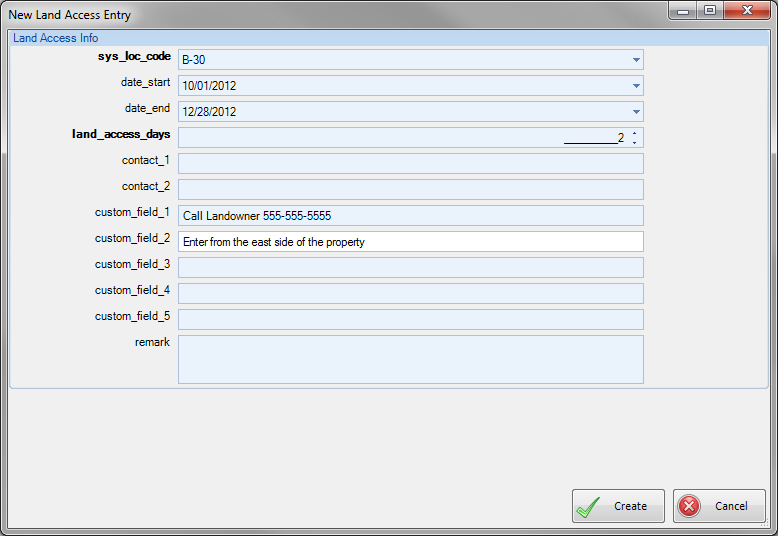 To edit a Land Access record, select the row and click Edit to be taken back to the Land Access Info screen.